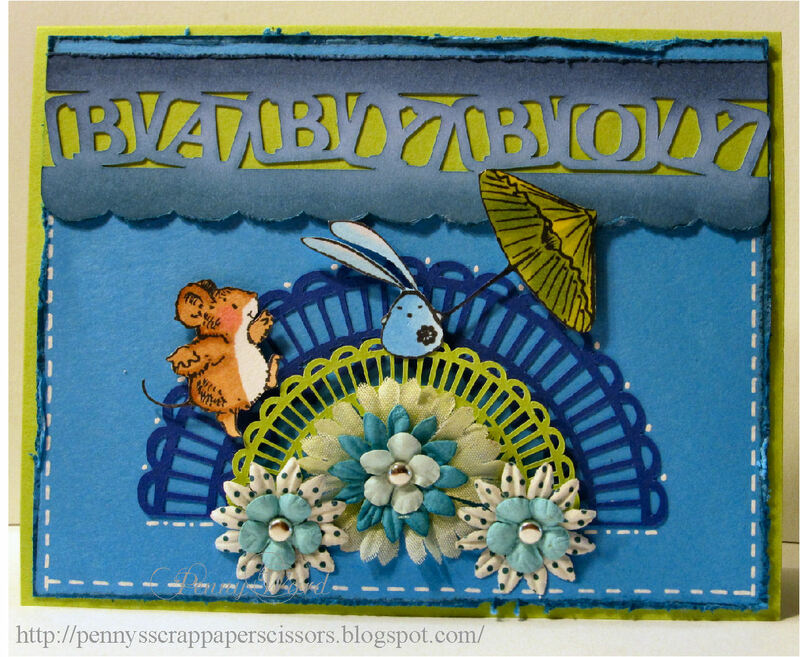 I used the Penny Black Touch of Whimsy stamp as well as the PB Spoolin' Around stamp. 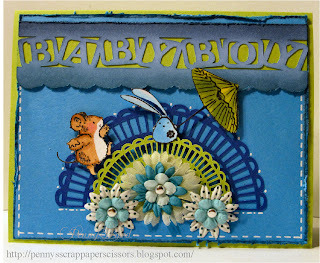 Cut the greeting and half circles with Silhouette, added some flowers and faux stitching. Distressed the edges and inked with Tim Holtz Blue Jean and Broken China inks. What a pretty card Penny, such lovely detail and stunning colours. Thank you for joining us at Penny Black at Allsorts this month and good luck. Great card Penny. I just love the little mouse on the wheel! Thank you for joining the challenge at Penny Black at Allsorts this month. This is such an interesting and pretty card Penny. I expanded the size to see all the lovely detail. It made me smile as it looks like the Mouse is running after the rabbit. How cute and a beautifully designed layout. Thank you for playing along in our challenge and sharing your lovely card with us at Penny Black at Allsorts. We hope you will join us next month too and good luck in the draw. Adorable & great take on m sketch! Great take on the sketch, Penny! Love that "animal"climbing towards the umbrella! The card is beautiful Penny, love it! The sentiment banner and half circles are amazing elements - love me some Silhouette!! Thanks so much for playing with us at CAS-ual Fridays! Looking forward to seeing more of your beautiful work in future challenges! Love your card...it's chock full of yummy details and love the mouse on the wheel. So creative! Thanks for participating in" Kathy's Lily Pad Palette Challenge. :)"